Dramatically reduce the look of wrinkles, redness, enlarged pores, and age spots with this "all-in-one" creamy serum. What is so Special about this all-in-one Skin Rejuvenator? 1. Wrinkles and Lines - The most obvious aspect of aging skin that people want to get rid of. 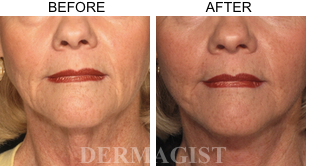 The Dermal Revitalizing Agent uses ingredients blended to exact specifications to target wrinkles, both deep and fine. Striving to boost the skin's ability to produce collagen and elastin, the Dermal Revitalizing Agent aims to improve the wrinkles from within the skin itself, rather than by just tightening the skin on the outside. 2. Enlarged Pores - As skin ages, the pores of the skin which were once invisible, can often turn into little holes on the skin. The more visible these holes become, as we age, the more they indicate the true age of the skin. No makeup or concealer can hide them entirely. One of the peptides in the Dermal Revitalizing Agent is precision-engineered to attack these enlarged pores, and drastically improve the look of the enlarged pores. 3. Age spots and dark spots - Environmental damage to the skin over the years often results in brown spots or uneven tone on the skin. In addition to making the skin less attractive, it also indicates the age of the skin. Rather than use harsh bleaches or chemicals, an ingredient in this product aims to naturally improve the skin tone, and make the dark spots less visible. 4. Redness associated with aging -Redness and "always rosy" cheeks are a very common sign of aging skin. While some color in the skin is nice, blotchy, red skin makes skin look older than it really is, and is the 4th common sign of aging that people want to target. The ingredient complex in the Dermal Revitalizing Agent directly targets and soothes that redness, and aims to provide skin the calm tone and color that young skin enjoys. 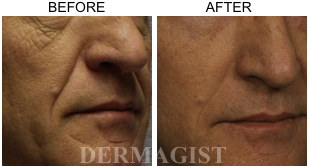 I am pleased to report to you, my results from using the Dermal Revitalizing Agent for a month. I truly appreciate the opportunity to try this product, especially since the results I experienced were mind-blowing to me. I'm a 55 year old man, and I guess I had the average signs of aging... wrinkles under and around my eyes and mouth, as well as large pores on my nose. My worst wrinkles were the ones on the left and right of my mouth, but I did have some fairly noticeable wrinkles on that very fine skin under my eye area. 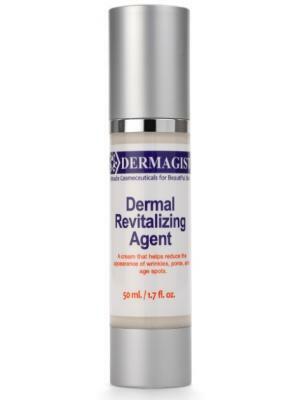 I first started using the Dermal Revitalizing Agent on a Monday, and I continued to do so twice per day for a little over 4 weeks. My results were actually pretty astonishing. I didn't notice anything until about the third or fourth day. At that time, my skin felt "thicker" for lack of a better word. It was much more firm and plump, and the finest of my wrinkles were less noticeable. I wouldn't say that others could notice the improvement yet, but I certainly could, when I looked in the mirror. By about the second week, though, I was getting comments from my kids and some of my co-workers. I have two daughters who are in their late 20's. They are both really into skin care products, so I was hoping one of them would notice the improvement in my skin, so that I could tease them about my "secret anti aging cream". Well, they BOTH noticed my skin at dinner, when they came to visit. My oldest daughter could not believe her eyes at the improvement in the wrinkles around my mouth. My other daughter kept trying to get inches from my face to look at the pores (that she now couldn't even see). She accused me of wearing MAKE UP, of all things. Well, needless to say, after the the month of using the Dermal Revitalizing Agent, I am just thrilled with how much younger my skin looks. Using the product was easy, even for a man with my little patience. I will definitely purchase this product when it goes on the market. My daughters will too ! They can't wait until the product is available, and are DYING to get their hands on it. I can't thank you enough for this opportunity, and I truly hope that this testimonial is a way to pay you back. I will be a customer for life! I was so excited to start my "age reversal" experiment! Coming from the UK originally, where the weather is cold, combined with my 20 years of smoking, had really taken its toll on my skin. I had serious lines around my mouth, as well as an overall bumpy texture and many discolorations or "age spots", as they are called. Having moved to California this past year, I was around lots of beautiful people with gorgeous skin. I really felt self conscious about my deep lines and spots, as well as the bumpiness on my skin. Your product came along just in time for me, and I couldn't be any more pleased with the results. First, let me describe the process of using it. The scent is pleasant. A light citrus which is not overwhelming at all. Once it's applied to the skin, the scent can not be detected. The texture of the cream was very light, and it absorbed almost immediately into my skin. In fact, I could apply my makeup right over the product within a matter of minutes, which is fantastic. Results wise, is where my sheer joy shines through. I only hope my words do a good enough job of telling you just how pleased I am. My wrinkles (expecially the ones by my mouth and on my neck) have been DRASTICALLY reduced in appearance. I have used tons of other wrinkle creams, but NOTHING compared to the way that this product just poured nutrients into my skin, and literally made the wrinkles and lines seem to vanish. I couldn't believe the progress I had made after about 3 weeks of use. I was so thrilled with the wrinkle improvement, that I didn't really notice how much my age spots had faded. I used to have a very large brownish patch on my right temple (along with many another little spots). The dark spot is now about 50% as noticable as it was, and the overall tone of my skin is getting better with every passing day. I am going to keep using this product, no matter the cost! It has made more of a difference in my skin in the short month I've had it, than did the other creams I used for years, COMBINED. My sincere thanks to the staff at Dermagist! Product : Dermagist / Dermajuv Eye Revolution Gel. All Items are new set, and original imported from USA.